Recreation That Educates Imagine a camera made in the late 1880s to early 1890s that was designed for young beginners. Something simple and inexpensive, yet at the same time could be a useful tool to learn how to take pictures. What type of photographic outfit would it be? Sometime during the late 1880s, a new category of camera was created by a handful of obscure yet resourceful makers. These cameras were built for beginners, children or "young amateurs." Compared to traditional equipment of the times, these were incredibly primitive devices ... nothing more than a box with a lens at one end and a sliding lid to load plates. Construction was amazingly crude. Poor-grade pieces of wood were assembled with simple tongue and groove construction. Even traditional cigar boxes were built with greater care then these cameras. Wood bodies sometimes had polished finishes (e.g. Shure Shot Detective Camera), but many were adorned with nothing more than a thin coating of flat black stain. 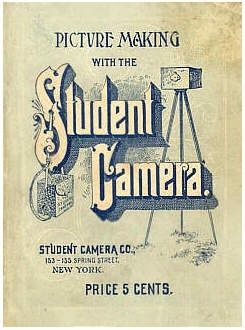 The Student Camera Company. NY. The Student Camera Company was one of a few makers that specialized in cheap cameras made for high-school students: hence the name. Two primitive, black-stained models were built and sold. 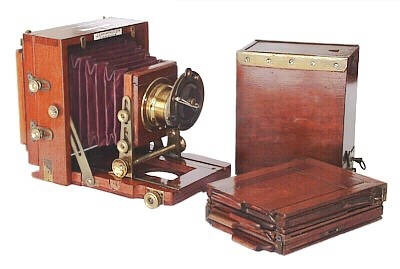 The Student No.1 Camera (shown above) was the original model that made images on 2-5/8 x 3-3/8 inch glass plates. Later, a larger No.2 model using 3-1/4 x 4-5/8 inch plates was offered. Both versions had simple flat-brass plates on the front with one or two small holes to regulate the amount of light. The shutter was simply a finger placed in front of the brass-plate hole. with accessory stone (see text). According to the comprehensive 64-page instruction booklet - an impressively large manual for such a cheap device - an outfit including a camera, folding tripod, carrying satchel with shoulder strap, and "all necessary apparatus and supplies for starting photography" could be purchased for $2.50. "To illustrate the advantage of price, there is a well-advertised camera in the market, the popular size of which makes a picture about one-half as large as the STUDENT and itself sells for twenty-five dollars; and yet in unprofessional hands the STUDENT will make four times as large a proportion of printable negatives as the other. A young gentleman of our acquaintance purchased the camera alluded to at the price mentioned, "pushed the button" one hundred times and paid ten dollars to have the "film" developed. As a result of the outlay of thirty-five dollars, besides time and car fares, he has eight negatives, most of which it would be base flattery to class second rate." This passage is interesting because the other camera mentioned might likely be the original Kodak Camera of 1888, which sold for $25 new, was advertised with a "push the button" slogan, and cost $10 to develop the film. Based on this information, Student Cameras were probably offered in the 1880s and early 1890s. Aside from its lack of good looks, what attracted me to the Student Camera was how the builder went to great extremes in portraying it as a sophisticated device. For example, the booklet promotes the camera as a better value because, "many of the parts that are supposed to be useful in a camera are entirely dispensed with." This comment specifically refers to bellows and double plateholders. The benefits didn't stop here according to the maker: "One advantage of our system lies in the necessity of developing each plate before another exposure is made. By this means, the beginner is educated from the start, as every fault is discovered at once, and avoided in after work." Digging deeper into the booklet, I came across a couple more comments that were either written seriously or purposely tongue-in-cheek. For instance, the camera is very light weight due to being made of thin wood boards. Understanding this became a problem when the camera was used outdoors on a tripod, the booklet author wrote: "If the wind blows, place a weight (a small stone for instance) on the camera to keep it still." Additionally, the builder gives us insight about the camera's cheap wood finish. Since it came with a case embossed with an imitation alligator leatherette pattern, the company felt that the camera's wood body didn't need to have a nice finish because "it is never seen outside the darkroom." The camera's no-frills design was clever in order to keep the price low. Since the camera did not have a viewfinder, two lines forming a 'V' were drawn on top of the case. The photographer would then look down the lines to line up the subject. Another area of creative cost-cutting was in the accessories. Instead of having to spend an additional $6 for a darkroom lantern, one was included in the outfit at no extra cost. All the owner had to do was build it by taking an orange piece of paper (included), dampen, iron flat, then roll into a cone and paste. To use, the cone was placed over a lit candle! However, the best part of this story is about the camera being durable: "The old-fashioned camera is a fragile and ramshackly affair, awkward to use and easily broken. The STUDENT can be thrown over a house without injury, and its manipulation can be comprehended and managed by any one." I can't think of a better reason to own a Student Camera outfit; accessory stone and all. Can you?